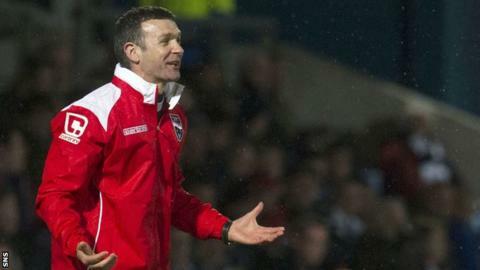 Ross County manager Jim McIntyre insisted the pressure has not lifted in the race to avoid relegation, despite recent good form. County have won eight of their last nine games to move six points ahead of Motherwell in 11th place. The Dingwall men have three home games in their remaining five fixtures as they attempt to remain above the play-off position. "I think we've got the hardest part still to do," said McIntyre. "We know we need to keep picking up more points. There's a pressure to do that, there's a pressure every week. "That's why we're in football and that's why we love it. You've just got to have broad shoulders and keep going." County's last win over St Mirren extended their unbeaten run of games to nine, form that translates to 27 points gained from a possible 29. "The confidence levels are as high as they have been but our feet are firmly on the floor, McIntyre told BBC Scotland. "Nobody's going to hand you safety. "I'm certainly glad that we have got three home games but you've still got to go and win them. "I think every team is going to be fighting for their lives. Realistically four teams can finish in that play-off spot so we're going to have to go and earn it." Partick Thistle are the first visitors after the split, presenting the opportunity to go above Alan Archibald's side with victory. "I'm very pleased that we've got a home game to start off although we know how difficult it will be," said McIntyre. "Thistle were up here a couple of weeks back and it was an extremely close match. "We know it's going to be difficult, then we're away to Motherwell which is another real tough game. "Every team is going to fighting tooth and nail not to get dragged into that play-off spot." Midfielder Michael Gardyne has been an influential figure in County's resurgence and believes the next two games will be vital. "We've got ourselves in a good position so we just need to kick on," he said. "If you win your first couple of games it's massive. "We're still very aware of what Motherwell are doing. We need to make sure we win our first game and that puts us in an even better position." Gardyne believes safety would provide a platform for the club to kick on next season under the guidance of McIntyre and his staff. "This is where the club deserves to be, it's done its time in the lower leagues," he said. "With the new management team and ideas they're bringing obviously they're going to be here for a full season. "I think they could do well next season so we need to make sure we can do the business and keep the club in the division."